Trailer is in very good condition. It has been used solely on the west coast between San Francisco and Seattle. When not in use it has been covered by a Cal Mark cover which will be included in the sale. The trailer is currently winterized and covered. My original asking price was based on comparison with other 2016 trailers; unfortunately, I was comparing my 19’ with a second generation 19’. 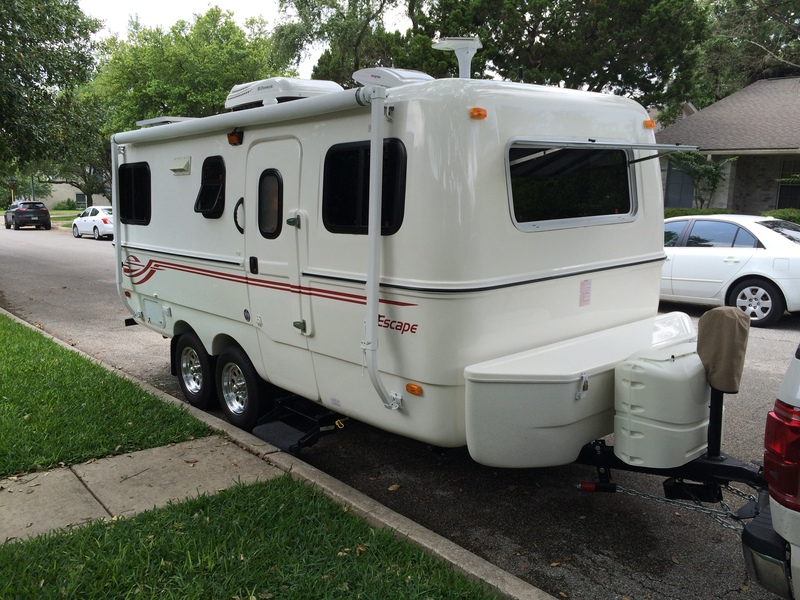 Is there a resource that explains the differences between 1st and 2nd generation Escape trailers? I sometimes see references to a "Classic" model. Is that a 1st generation? I don't know about a "resource" but I can explain most of it. Reace redesigned the molds for 2017. The original design is sometimes referred to on the forum as the 'classic'. The big changes with the 2nd generation are flat sides, and a standard type flat entry door, and conventional screen door. The classic models have curved sides and a curved molded fiberglass entry door. The doorway of the 2nd generation models is also a bit wider than on the classic. That's an important difference because it allowed Escape to change out the Dometic 8 series fridges (which were riddled with cooling issues) for Dometic Americana line fridges. The Americana is too wide to fit through the classic door. Having said that, the 8 series RML fridges in the classic trailers were replaced with 8 series RMD fridges in early 2015. That was a major improvement. It's not the Americana series, but they work fairly well. There's another design difference with the awning. On the newer models there is an indent along the top on the passenger side for the new awning to mount in. The new awnings are electric case awnings and have no side support arms like the manual awnings on the older Escapes. Because of the flat driver and passenger sides, there are also minor differences in the profile and design of the bulkheads and the upper cabinets as well. They've also added the support pole near the door on the 19 model. In the 1st generation Escapes, the support pole was only in the 21 and the 5.0TA. Another significant change was the move to frameless windows that open like an awning, tilting out from the bottom. Also, instead of a single non-opening window in the rear, the newer models feature a split rear window that opens. The newer windows are very nice. There may be some other minor differences like light fixtures, but that's about it. Here's a photo of my "classic" with the curved sides and door. Compare it to the photos of the 2nd generation and you can easily see the differences. Most of the area of the sides was always flat (that's why flat windows and access hatches fit), but in the first generation (or "classic") body the top parts tilted slightly inward from the middle to the roof, and similarly the bottom tilted inward from the middle to the bottom. The second generation (current) design puts those flat parts vertical (making the flat door fit). The sides still are not completely flat, because (in addition to the obvious curves at the transition from walls to roof and bottom) the band around the middle sticks out a bit (as it always has). Since each model is the same overall width before and after the change in design, it is a little wider at both roof and floor. This moves the wheels out a couple of inches on each side, so the spacing between the frame rails is four inches longer, the axles are four inches longer, and there's a little more space inside at floor and ceiling levels. This is one reason that the new design is slightly heavier. Hello my name is Mike and I'm in Redmond OR. When can you show your trailer? I left a text message on your phone. Contact # after seeing rules of postings.